Hope this can get resolved. (*temporary) = "attempt to perform arithmetic on local 'elapsed' (a nil value)"
I was wondering if EasyMail tracks the mail and will notify if it is nearing expiry? Altoholic did this, but, sadly, it has been asleep. Any plan on fixing the issue since the launch patch? 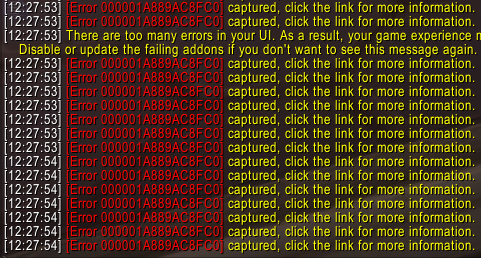 YES, this addon, while loved and outstanding, is causing wow to exit when mail is reloading from a full mailbox. I too am unable to get a screenshot or error code to find out what is causing the forced exit. Addendum: I had to perform further study of the situation and so I removed all my addon completely (I am due for a major update anyway). I entered the game with only Blizzards stuff and went to my character that does all my Auctioneering, when I checked my mailbox and got my mail, I didn't get booted but instead I received a "Database Error" as my mail collected the gold earned from auctions. I don't think the issue is with EasyMail or any other AddOn, but with Blizzard. I think this addon is causing WoW to exit out/close when I check my mail. I can't get any screenshot of it nor LUA errors, but it's my only mail addon and these crashes of WoW never happened before. There's an issue with mail attachments. If you have multiple mail with attached items, and collect all the stuff from the first mail, the second one moves up, but the items displayed will be replaced with the icons for the previous mail. Here's an example. The first mail included the "Eye of Burning Shadow" which (I think) has a unique icon. As you can see, the next mail (when it moved up) retained that icon for that item, instead of using it's own icon. This happens with all items, and for multiple items if the previous mail had more than one. I hope you can fix this. We really enjoy using your addon. I already miss the "Open All Mail Button". Please add it as an option in settings. Agreed, first thing I did when i realised this was gone was edit the luas to remove the hide file and it's references. Other than that though, thanks for a great addon Meeanda and for keeping it updated! Do you call this as "working flawlessly"? And yes, all of these errors are spammed all the time as you have the mailbox open. The comment before me posted the error so I won't repeat it. Awesome! Works perfectly again. Thanks! The latest version missed a couple PlaySound calls in the XML files. I added an issue to the CurseForge issue tracker with my edits to fix the problem. Your "fixes" are a mess. Thanks for posting the changes SpareSimian! 1. Run Notepad, and open EasyMail.xml . 3. Open EasyMail_Options.xml, then repeat step 2. I followed the steps of replacing sections in the lua file and it works great! Thanks !!!!! For those who don't want to fix the addon code, you can use the addon PlaySoundFixer.